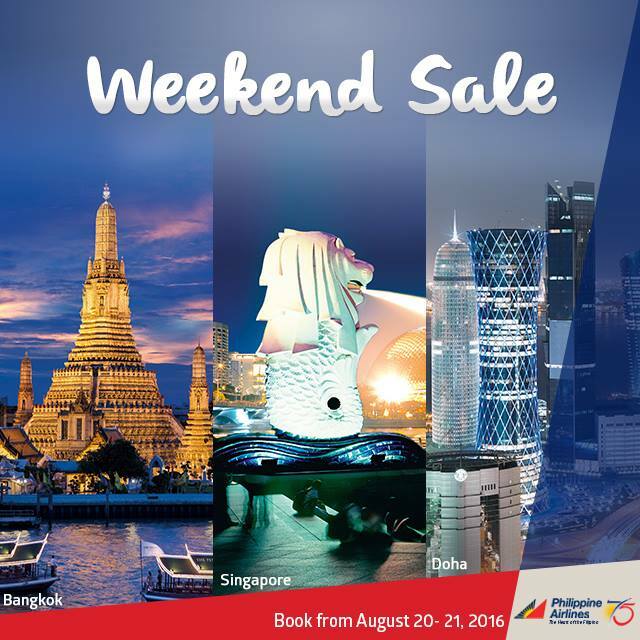 Philippine Airlines Promo 2017: Travel to Singapore, Bangkok, Doha, Qatar or Abu Dhabi with our weekend sale! Book your flights now! Enjoy these low fares with PAL's Weekend Sale Travel with the airline that celebrates the Heart of the Filipino. Singapore is a perfect destination to go in Southeast Asia where you get to check a lot of tourists attractions for you and the whole family to enjoy. Thailand and the capital city, Bangkok is full of colorful traditions and good food for you to savor. While Doha, Qatar and Abu Dhabi are Arab hubs for those exquisite travel and fine dining experience. Fare is equal to base fare + government taxes & fees + terminal fee. Fares are subject to change due to currency conversion rate. Quoted fares are rounded off to the nearest whole number. Fares are valid for roundtrip travel. Change fee is USD100 for Guam; USD50 for Singapore, Bangkok, Abu Dhabi, and Doha. No-Show fee is USD75. Ticket is non-transferable and non-refundable. Ticketing Service Fee is not applicable for web purchase. PAL will collect No-Show fee unless booking is cancelled 24 hours before departure date. Infant fare is 10% of adult fare. Child fare is 75% of adult fare. Mileage accrual applies. Other conditions apply based on existing fare basis of the ticket. Fare is inclusive of 7-kg handcarried baggage. Free baggage allowance is 30kg for Singapore and Bangkok. Free baggage allowance is 2 pieces at 23kg each for Abu Dhabi and Doha.